From the towering Xerox Square, to the grand Civic Center, to the glistening Riverside Convention Center, virtually every corner of downtown Rochester has been “revitalized”, so why does it still feel so dead? Few people walk on the streets, retail is almost nonexistent, and there is an overall sense of abandonment. However, taking a look at a picture of the skyline, you might think it’s downright impressive for a city you’ve never heard of in Upstate New York. The visual flair of Legacy Tower, monumental stature of Xerox Tower, iconic cylinder atop First Federal Plaza, and impressive arch of the Douglass-Anthony Bridge give Rochester the apparent character of a true metropolitan hub for the Finger Lakes region. Unfortunately, a quick walk around downtown would surely leave a less flattering impression; even in the middle of a weekday, the streets are scarcely populated. So why hasn’t the grandeur of the renewal projects translated into a bustling downtown? The biggest problem with Rochester’s “downtown renewal” is its dependence on the suburban commuter for viability. Until the mid-2000s, virtually every major development had been designed with the mentality that easy access by car would be the key to a healthy and strong downtown. Gone were the dense clusters of housing (only Grove Place remains), the narrow streets, the storefronts. In their place stand parking garages, office buildings, concrete plazas, and highway interchanges. It’s a startling example of the urban network of towers and highways predicted by the likes of Le Corbusier. Downtown was once a dense, mixed-use urban core, now transformed into little more than a suburban-style office park, with the street life to match. It should come as no surprise that Rochester’s skyline is alive and well while the streets remain dead. In fact, the tallest building in Rochester, Xerox Tower, is part of the problem. The tower is the centerpiece of a larger block of 1960s redevelopment called Xerox Square. The only street level amenities include an auditorium and a vast, partially sunken, concrete plaza. The tower itself is set back from the street on all sides by at least 60 feet. The resulting gap around the base is simply dead space, largely unused despite full occupancy of the tower. This is due to the location of the primary entrance in the underground parking garage. Commuters (the sole users of the tower) park their cars and take an elevator straight into the building without having to set foot outside. Xerox Square has killed a block of downtown by deactivating the streets on all sides, eliminating any reason for someone other than a Xerox employee to go near the area. Despite a generous addition to the city’s skyline, the iconic tower’s effective contribution to downtown is limited to a traffic jam in the morning, a few hot dog stands at lunch, and another traffic jam in the evening—hardly a recipe for a thriving neighborhood. Xerox Tower is certainly not alone in its hostility towards pedestrians. Virtually every skyscraper in downtown retreats from the pedestrian realm, giving fewer and fewer reasons for anyone to get out of their car and walk around, let alone live in the place. A recently re-branded tower known as The Metropolitan was finished in 1973 at the corner of Main Street and Clinton Avenue. Until its current redevelopment began, the tower was set back and cut off from Clinton Avenue with a sunken plaza, relying on an overhead skyway entrance to funnel workers over the street and into the building. On the Main Street side of the property, an elevated plaza was used to create a 200 foot buffer between the tower and street. The stretch of Main Street, once lined with storefronts and entertainment venues, now consists of nothing but a stairway to a nearly vacant shopping concourse under the plaza. Unsurprisingly, the reliance on single-use office space led to the tower largely vacating as the downtown office market dried up. Couple that with its adversarial attitude toward pedestrians and, until now, The Metropolitan solidified this block of “renewal” as a dead zone along Main Street. The Alliance Building (below) exhibits the physical scars of “renewal”. The lower portion of the building once sided with shops, apartments, and theaters that engaged pedestrians on Main Street. The old buildings were destroyed and replaced by a dark stairway leading to an underground shopping concourse, which vacated long ago. Notice an example of actual urban renewal to the right. A Hilton Garden Inn has opened in the old National Clothing Building along Main Street. The structure is built right up to the sidewalk and features large windows and doors opening right onto Main Street. Passersby can see the activity of the new hotel and restaurant just by walking down the street, an experience endangered by the “renewal” seen on the left. You can catch a glimpse of the old structures which lined Main Street on the far left side when good urbanism dominated Main St. The old National Clothing Building, now a Hilton Garden Inn, is the third building from the left (Photo from the Rochester Municipal Archives). These are just two examples of a long list of projects (Clinton Square, Legacy Tower, First Federal Plaza, 3 City Center, ESL Headquarters, Five Star Bank Plaza, the Inner Loop, Civic Center, etc.) which have, block after block, destroyed the capacity of downtown to cultivate a diverse, thriving urban core. This is not merely the result of uncontrollable market forces pushing residents out to the suburbs; these grand renewal plans had significant financial backing from the federal, state and local governments who envisioned a stark, modernist downtown devoid of human-scale, or incremental development. A rendering of downtown under the vision of the 1965 Genesee River Plan. The plan was never fully implemented, but many parts of it are visible today in the form of First Federal Plaza, Crossroads Park, and the Radisson. While the funding for large-scale urban renewal plans is mostly gone, its spirit lives on in modern zoning. 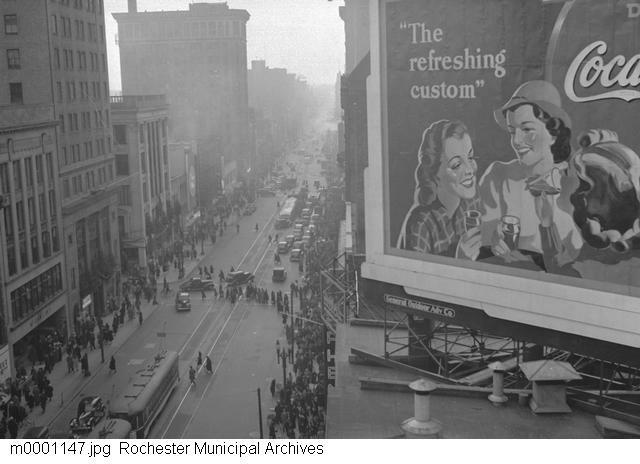 To this day, much of downtown Rochester is zoned as a Tower District. Any development there must “build upon the monumentality of the district to create grand public promenades and plaza spaces” and be no fewer than five stories in height. The nearby Washington Square Urban Renewal District builds upon those requirements, explicitly limiting any development to administrative and government offices, retail, day-care, or parking garages. The red line indicates areas of downtown which are zoned CCD-T (Tower District) or Washington Square URD (Urban Redevelopment District). The zoning code effectively prohibits any sort of small-scale, incremental development for a huge portion of downtown. Instead, these zones are reserved for the exclusive use of large developers willing to invest in massive, all-or-nothing projects like the Legacy Tower or the Excellus Blue Cross Blue Shield offices, both of which sit empty outside of work hours. Rochester should learn from the failure of local titans of industry (Xerox, Bausch & Lomb, Kodak) and realize that a downtown of grand or monumental scale is hardly a prerequisite of success and vitality. In fact many places with considerably more active downtowns exhibit a far more humble appearance than Rochester (e.g. Princeton, New Jersey; Summit, New Jersey; Easton, Pennsylvania; Ithaca, New York). It’s time for planners to permit a more granular approach to downtown development and eliminate nonsensical mandates of high floor counts and monumental scales. If Rochester truly wants the quality of its street life to match that of its skyline, it’s time to think beyond the form to the function of its buildings and how they connect with their surroundings. Fortunately, recent efforts on behalf of the city and private developers alike have moved towards fixing the planning failures of the past, and downtown is slowly but surely heading in the right direction. But to address the root of the issue, planners must work towards continuing to relax a zoning code fixated on some twentieth century vision of a downtown built for cars and commuters. Codes should allow developers every opportunity to incrementally build downtown as a true place to live again. Until then, the gap between the grandeur of the skyline and the health of the streets will remain.